DVI Aviation’s Lubricant and Grease Experts have access to a wide range of laboratory instrumentation and can provide a complete analytical package to investigate all types of Tribological problems involving engines, gearboxes, hydraulic oils, greases, lubricants, and fuels. By analyzing the condition of wear particles DVI’s Aviation Lubricant Experts can often times identify the cause of wear. Degradation of a lubricant requires an evaluation of the chemical structure, detection for the presence of contaminants, and knowledge of the metallurgy of the component from which a sample of lubricant was extracted. For example, aircraft engines are fabricated from a variety of materials and alloys. Even though the engine’s lubrication system is designed to keep the components in the engine lubricated to reduce friction, in the course of normal operation, the engine undergoes a minute and continuous amount of wear. The wear debris is released from any contact surfaces and is suspended in the lubricating oil. Spectrographic analysis of the lubricant can assist on identifying the wear debris and the level of concentration. Some the more common wear metal measurement techniques include atomic absorption, inductively coupled plasma (ICP), atomic emission and X-Ray fluorescence spectrometers. DVI’s Aviation Grease Experts can analyze used greases for moisture content, wear particles, acid build-up, and spectrographic metals. This analysis is most useful in performing a comprehensive investigation to determine the reason for a grease failure. The grease tests performed by DVI’s Grease Experts normally comply to an ASTM test methods, but can also include modified or customized tests. A wide suite of test rigs and test methods are available to assess grease performance. Often, for one reason or another, it becomes necessary to change the brand of grease used to lubricate a particular component. If the grease in use may become mixed with a new brand, the question of grease compatibility must be addressed. Grease compatibility can be a complex subject because of the many variables and changing conditions involved. At one end of the scale, mixing a fresh lubricant with a severely oxidized portion of the same lubricant may produce immediate or progressive changes in the mixture. At the other end of the scale, greases with different thickeners may be mixed resulting in hardening or very soft or low melting mixtures which may not provide adequate lubrication and may lead to early failures. Add to this the diverse operating conditions of time, temperature, and contaminants — and the uncertainties of predicting or measuring compatibility of greases are apparent.. The NLGI Lubricating Grease Guide, Fourth Edition, 1996 defines grease Incompatibility as follows: “When greases made from different thickeners are mixed the mixture may be poorer in service performance or physical properties than either of the component products. This lessening in performance capability is called incompatibility. It may show up in any of several areas, such as (1) lower heat resistance; (2) change in consistency, usually softening; or (3) decrease in shear stability. 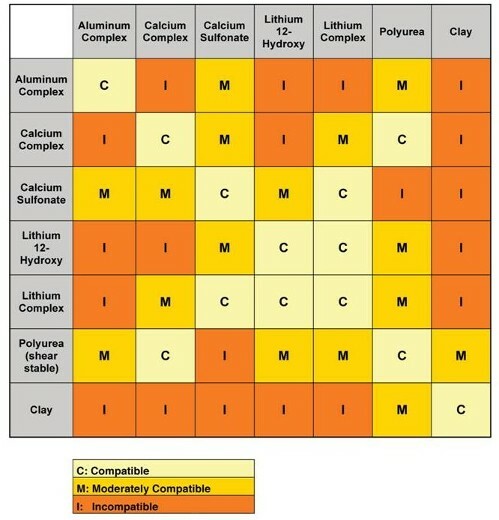 Mixtures which show none of these changes are considered compatible. Incompatibility is best determined in service or in service-related tests; it is not predictable." In accordance with the recommendations of NLGI, DVI's Grease Experts have the necessary expertise and testing capabilities to determine grease compatibility.